A seven-year deal to bring the European Grand Prix to Valencia was signed in 2007 between Bernie Ecclestone and promoters Valmor Sport Group, headed by ex-motorcyclist Jorge Martinez Aspar. The deal came despite Ecclestone previously insisting no European country should host more than one grand prix a season (Barcelona hosts the Spanish race). 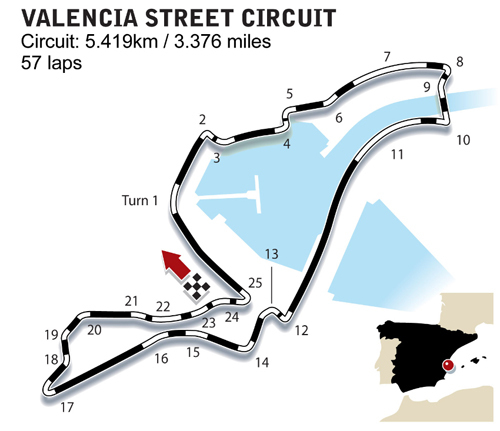 The new road circuit is based in Valencia's harbour area which was heavily rebuilt as a home for the America's Cup Yacht race which was hosted by the city in 2007 and 2009. There seems to be an unwritten rule in modern F1 that you can't design a new circuit without the expertise of Herman Tilke, and Valencia is no exception. He designed infrastructure and buildings including a 140-metre long swing bridge that links the two sides of the harbour and allows the track to make the best use of the natural features. Although essentially a road course, the designers have tried to incorporate all the safety features of a permanent circuit. The circuit was tested for F1 by running a meeting at the end of July 2008 which featured Spanish F3 and International GT's; the F3 race was won by new local F1 hero Jamie Alguersuari. The first grand prix was held nearly a month later, and was won by Ferrari's Felipe Massa from pole. Ticket sales for the race were sluggish for the second race in 2009 but were stimulated on the news that Michael Schumacher would return to F1 to deputise for the injured Massa. The organisers refused to refund tickets after he cancelled his comeback. In 2010 the attendance fell from a high of 112,000 two years earlier to 75,000, leading to speculation the costs may lead to the organisers seeking to get out of their deal with Ecclestone.